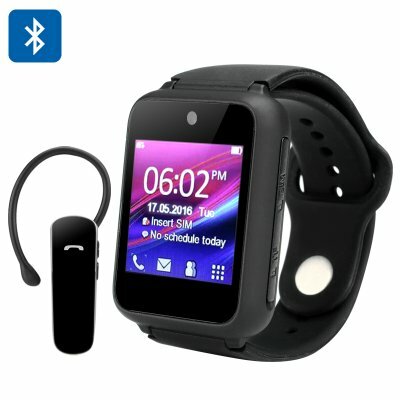 Successfully Added Ken Xin Da S9 Smart Phone Watch - Standalone Wearable, Quad Band GSM, Bluetooth Headset, 1.54-Inch Touch Screen, Camera (Black) to your Shopping Cart. Do you need to stay in touch with others but find yourself unable to work properly with a phone in your hands? Worry not – the Ken Xin Da S9 standalone smart watch has you covered! The S9 is a standalone watch phone that doesn't need to be paired with a separate phone or mobile device. You could easily handle sending and receiving calls using only the S9 attached to your wrist. This is especially useful for outdoorsmen, shop workers, technicians, and other folks who find it more convenient to work with wearables instead of phones or tablets. Another useful feature of the S9 is its quad band capabilities. It enables the S9 to work on all four major GSM frequencies, which means that it'll be compatible with all the main carriers around the world. You'll be able to use the S9 to make calls no matter where you are. If there's a carrier, then theres a good bet the S9 works with it! Another plus for the S9 is its ability to both record and to play back audio/video files. First off, the S9 possesses a 0.3MP camera that is able to capture serviceable photos and videos. This gives the S9 added versatility, from snapping a picture of diagrams and photographs to recording video for later use and review. Add to that a slot for SD cards up to 16 gigabytes, and you have a compact but capable media center attached to your wrist. The S9 also comes with a few other useful functions, most notably an alarm, a calendar, and a calculator. These built-in apps add even more pragmatic value to the S9; letting you stay on top of your schedule and your tasks while helping you crunch numbers on the spot. The best part is that the S9 doesn't have to cost you an arm and a leg. The affordable price of the S9 makes it an ideal partner for the budget-conscious user that needs a solid, reliable, and hard-working partner to keep them connected! All this makes the Ken Xin Da S9 an ideal wearable for those that need to stay in touch with friends, family, and colleagues while constantly in motion! The Ken Xin Da S9 smart watch phone blackcomes with a 12-month warranty, brought to you by the leader in electronic devices as well as wholesale standalone smart watches..